I lost my voice. I was exhausted but everyone had a blast. I may actually be getting good at running comic cons. Stay tuned. 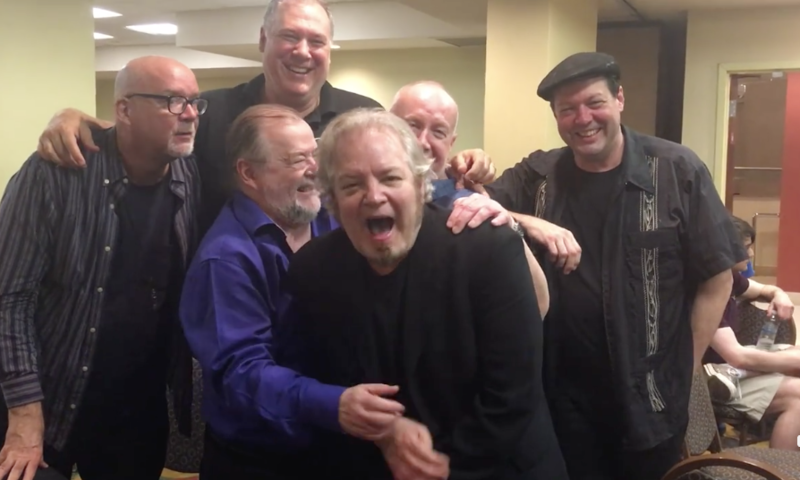 Don McGregor molests me as John Holmstrom, Dave Ryan, John Higgins, and Shannon Wheeler yuk it up. 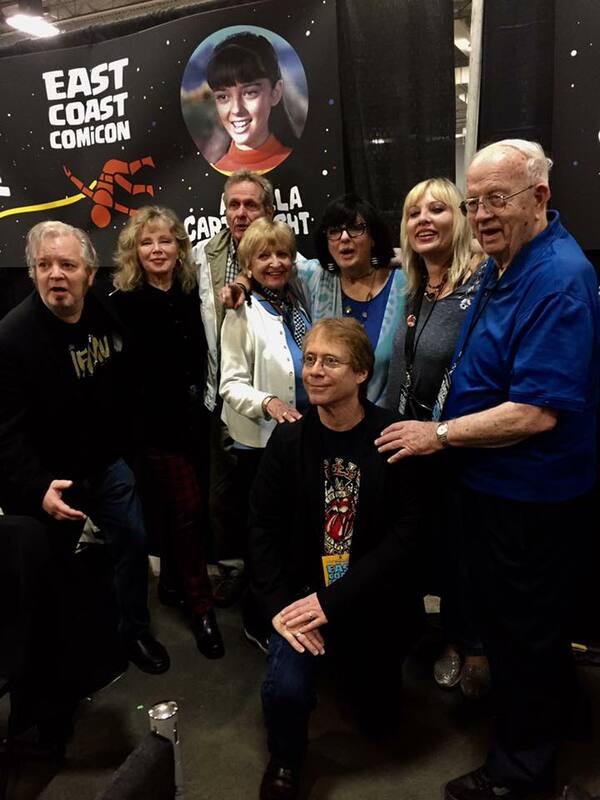 The comics talent was off the charts this year with Larry Lieber, Denny O’Neil, Mike Zeck, Geof Darrow, Yanick Paquette, Ken Lashley, Bill Wray, Kevin Altieri, Shannon Wheeler, Fabian Nicieza, James O’Barr, Don McGregor, John Higgins, Mike Grell, Dave Ryan, James Warhola, JM DeMatteis, Michel Golden, Ann Nocenti, Jim Salicrup, Danny Fingeroth, John Holmstrom and many more. This may have taken over six weeks to complete, from concept, to sketch, to layout, to pencils, to ink, to Photoshop, typography, to what you see before you. Every year, I make a poster for East Coast Comicon with varying degrees of success. You can tell which years the Lyme disease was active in my brain just by looking at how bad some of the posters were. Conversely, I hope you’ll agree, I’m Lyme-free this year. Yes, it’s political. Sorry to upset you if you voted for a faux billionaire who assaults women and lies every time he opens his mouth. Actually, I’m not sorry. 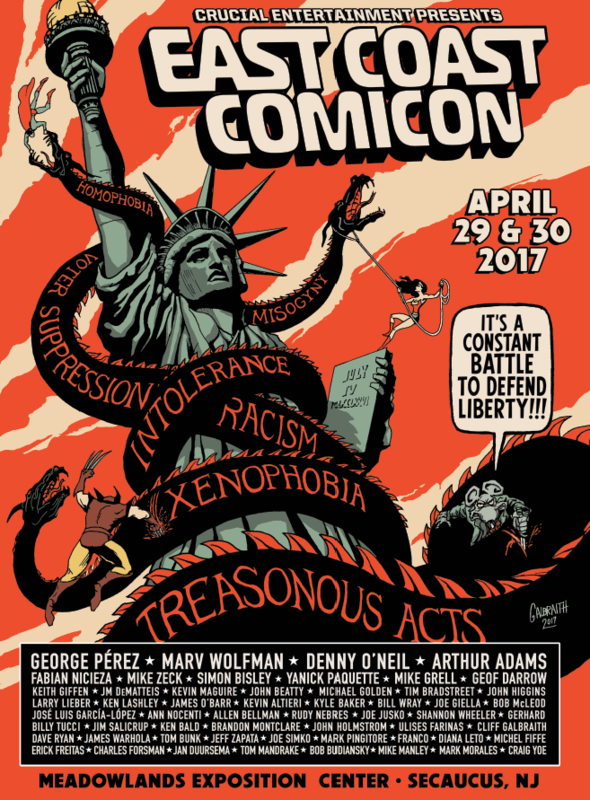 Don’t think your favorite comic artists should be political? Then you haven’t seen them on Twitter. Artists have always been political. Ever see Picasso’s Guernica or Warhol’s portrait of Richard M. Nixon? Diego Rivera? And countless others? The arts, and that includes comedy, are how some of the greatest political commentary has reached the public. Enjoy the poster. Or not. ME MAKE BANNER! BANNER GOOD! 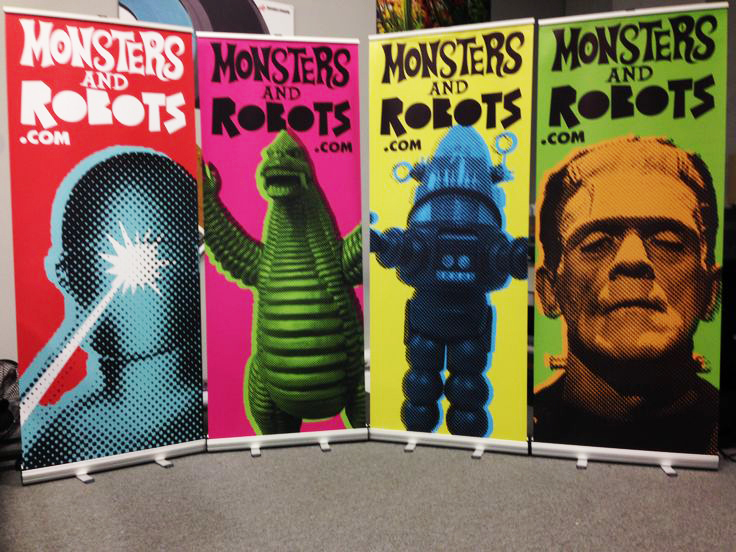 Found this pic of a series of banners I designed to promote my horror/sci-fi con Monsters and Robots. I banged out eight of these in one afternoon with the help of the mighty David Smith cleaning up my concepts and color choices. What was originally a news site about all things monsters and robots and their respective genres, morphed into a convention in 2016. For a new show, it had its marketing challenges, but the fans loved it and the vendors did well. But my Lyme disease came back around that time, so I shelved Monsters and Robots until 2018. More news about that soon. I’ve never been involved in a protest. I was a child in the 60s, and was completely aware of what was happening in Vietnam and in streets of America, but I was too young to take part. By the time I was 15, the Vietnam War draft was discontinued and when I was finally 18 the war had ended and President Nixon was long gone. I’ve never romanticized about the glory of mass protest or war — both can be a dangerous commitment. My problem has always been, that because of the times or other circumstances, I’ve never served my country. 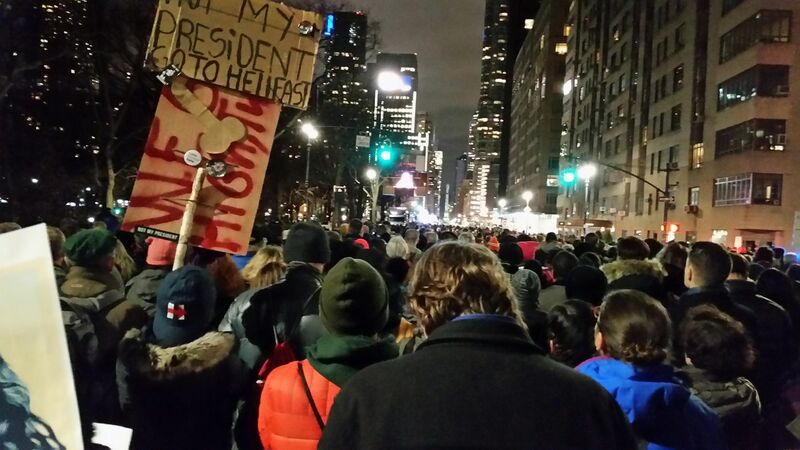 On Jan 19th, the night before Donald J. Trump took the oath of President of the United States, I took the train from my home in Red Bank, NJ and joined 25,000 fellow Americans in NYC to be heard. I plan on serving my country with a commitment to resist all forces that would degrade our liberties. 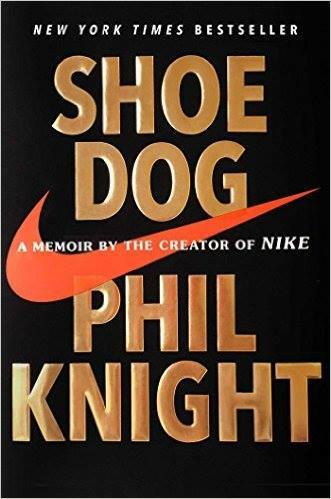 My favorite book of 2016 was Nike co-founder, Phil Kight’s memoir of the history of Nike, “Shoe Dog.” It’s not really about sports or dropping names of famous athletes (yet it does that only when needed), but rather about an unlikely cast of characters who reinvented footwear, and were undaunted in their mission. They fought their competitors, the US Congress, the US Customs Department, and even their own supplier. They were sued, cheated, lied to, and bloodied at every step in their climb to the top. Sure they prevailed, we know that, but it’s how they succeeded that makes for great reading. I came to admire Phil Knight because he never quit. He always found a way. I call books like this Adventures In Business. As an entrepreneur, of course, I’d be interested in a success story like Nike’s, but corporations aren’t always compelling bedtime reading material. Knight’s story is the exception and begins with a journey that takes him around the globe as a young man and prepares him in ways he never imagined. As with all books on business, I’m always looking for pearls of wisdom; Shoe Dog is full of them. Not just for business, but for many other aspects of life. A great book about business. 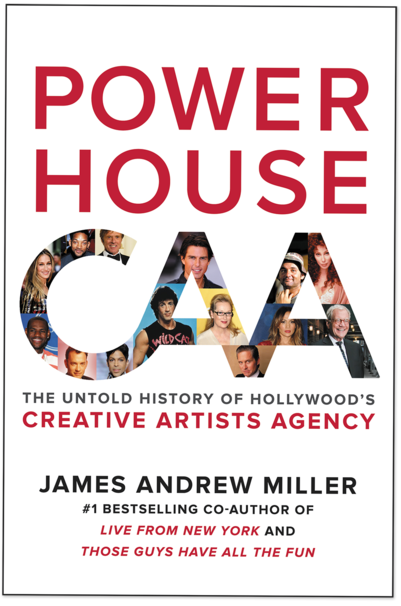 Some fun Hollywood gossip stories, but I found it most interesting when the book got into deals and expanding the market of what CAA was involved in. There were excesses and hubris, and plenty of lessons to learn from. It wasn’t as interesting after Mike Ovitz left the company, and it was tough to keep track of everyone who came afterward. I’m not sure I’m qualified to write about this book, other than that it brought tears to my eyes. 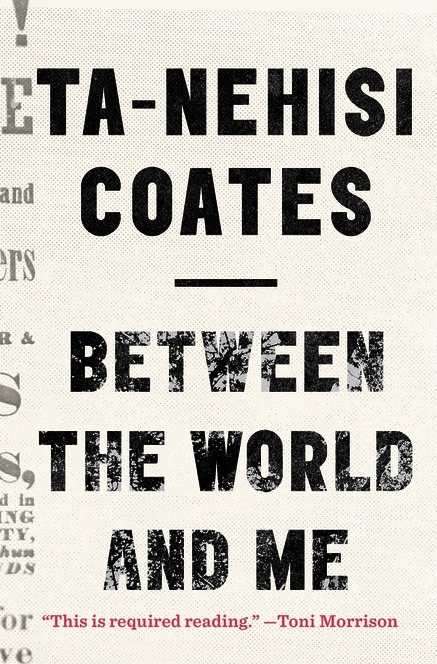 I did get to meet Ta-Nehisi Coates at NY Comic and told him how important I thought this book is. I haven’t drawn superheroes since I was eight years old. 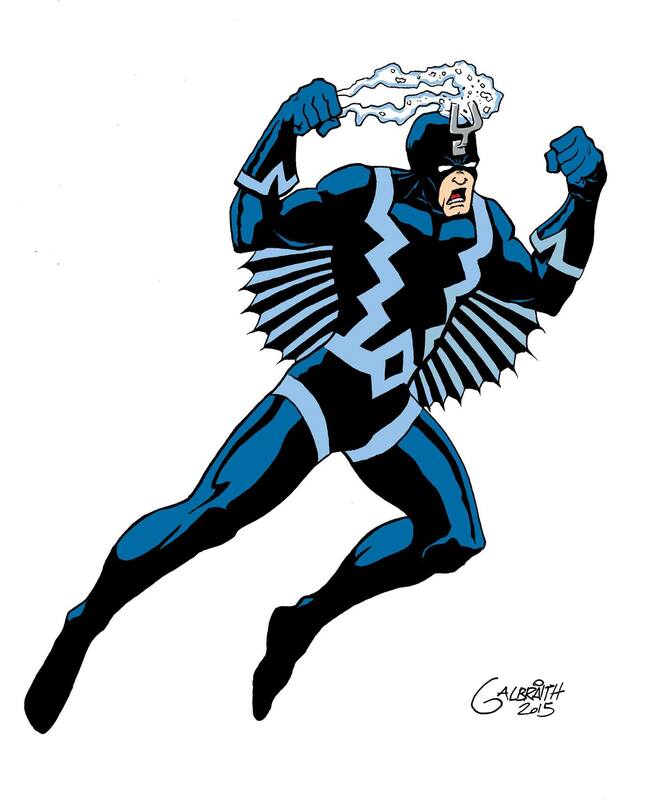 So when I was asked to draw a Marvel character for a comics magazine for an artists jam, I chose Black Bolt!!! 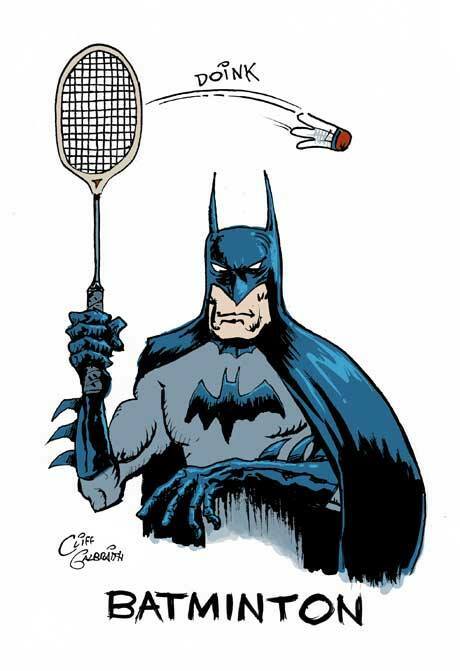 It’s summer — get out of your Batcave and play some batminton. I’ve enjoyed Liev Schreiber since I saw him in the 1996 indie film Daytrippers opposite Parker Posey. 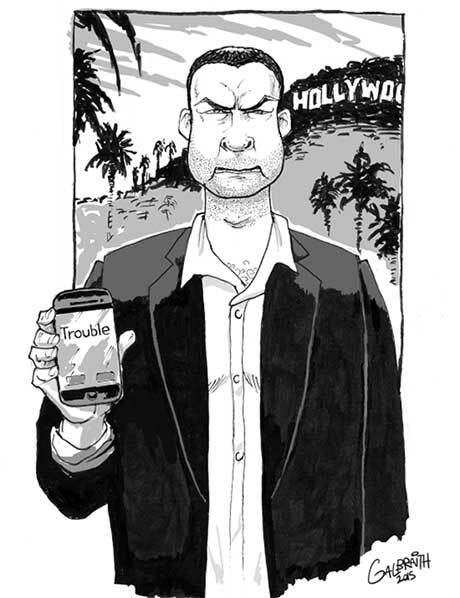 He stars in Ray Donovan as the fixer Ray Donovan and his unique look compelled me to put pen to paper.